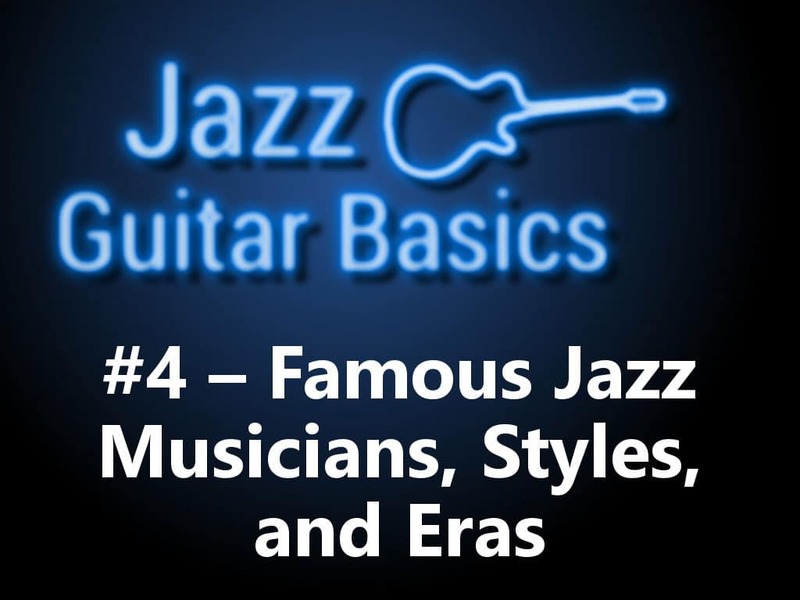 Welcome to article #4 of my jazz guitar basics series, where we will go over a list of famous jazz musicians that every jazz musician should be familiar with. This article will not be about guitarists only, because so much of the jazz background and history is centered around non-guitar players. In fact the guitar is sort of a small part of the overall historical picture. But we WILL be discussing guitarists! After all this is a guitar web site. Let’s get started. DISCLAIMER: This is not to be used as a substitute for a thorough history lesson or documentary on jazz history. The information in this article is simply, my recollection and knowledge of the most important points to remember in the terms of the styles, eras, and artists. It’s important for jazz musicians to be familiar with the history of jazz and the different styles of jazz. Jazz is a music that is relatively new. It is known as “America’s original art-form,” since it originated in the United States in the early 1900s. Since it came on the scene, however, it was constantly evolving, with artists continuously exploring new ways to play. The following list is a very rough timeline of the styles and “eras” that are attributed to the jazz art form. The type of jazz I love, and am referring to in this article series is the jazz that came out of the bebop, cool jazz, and hard bop time periods of the 1940s – 1960s. These are styles that rely heavily on improvisation. I’m not a huge fan of any of the style of jazz that didn’t originate or is inspired by music outside of those time frames. I’m not into ragtime, the Dixieland/big-band stuff, free jazz, or jazz fusion. I like the trios, quartets, quintets, and so on. By the way, if you didn’t already know what smooth jazz is, just think of the Weather Channel or elevator music, and that should give you an idea. Picture the TV showing you maps of weather patterns moving across the screen, and imagine the music that is playing while they show it. Here is music from Norman Brown to get an idea. It’s kind of cool, if you’re in the mood for that type of vibe. Here is a list of several non-guitar jazz musicians that you should be familiar with. I recommend you study all of these musicians if you decide to further your jazz journey. Of all of the artists above, the ones that you should study, without question is Charlie Parker, John Coltrane, and Miles Davis. They are probably 3 of the most well-known jazz musicians today. As far as my personal favorites, I like Paul Desmond, Sonny Stitt, and Stan Getz. Listen to all of them, and see which ones are yours! Now that we have the non-guitarists covered, let’s look at the guys who you really need to know about! When you look at this list, do your research on all of these artists. LISTEN TO EACH ONE OF THEM. Get on YouTube and search for albums and recordings for each of them. Find examples of their music that you’d like to play and draw inspiration from. This will help you in determining the type of music you want to play and the jazz musician you want to be. This is, by no means, a complete list of all jazz guitarists. They are just the ones that I’ve become the most familiar with from my last few years of listening to and studying jazz. Probably two of the most famous are Wes Montgomery and Joe Pass. Go through the list of musicians and start listening to some of them. Pick out one medium paced tune that you want to learn. You can get ideas of tunes from my article on jazz standards. The cool thing is that most of the artists I mentioned in this article have made recordings of each one of the jazz standards. I’m not saying you’ll always get that lucky, but you might! Once you get to know some of the artists better and listen to some of the standards you want to play, you may be ready to tackle jazz improvisation. It’s a huge topic that you can spend a lifetime on. But, you have to start somewhere, and I’d be honored to introduce you to that topic in the next article. Click the button below to check it out. Hope to see you there!